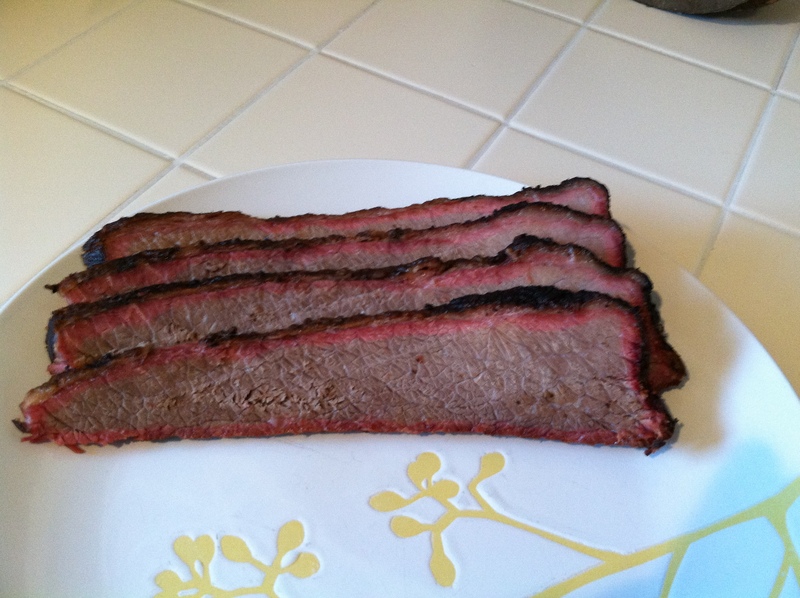 I finally endeavored to conquer the pinnacle of BBQ today- Smoked Texas Brisket. This undertaking was literally weeks in the making; hours spent on the Smokenator Forums, AmazingRibs.com and many others- along with some ongoing encouragement in the form of late night ‘dates’ watching BBQ Pitmasters. I even exchanged emails at one point with David Bouska, a Champion on BBQ Pitmasters. My goal was this- work through all the noise out there- differing opinions and the like- and to try to find that perfect combination of approach, recipe and outcome that would deliver competition level brisket. 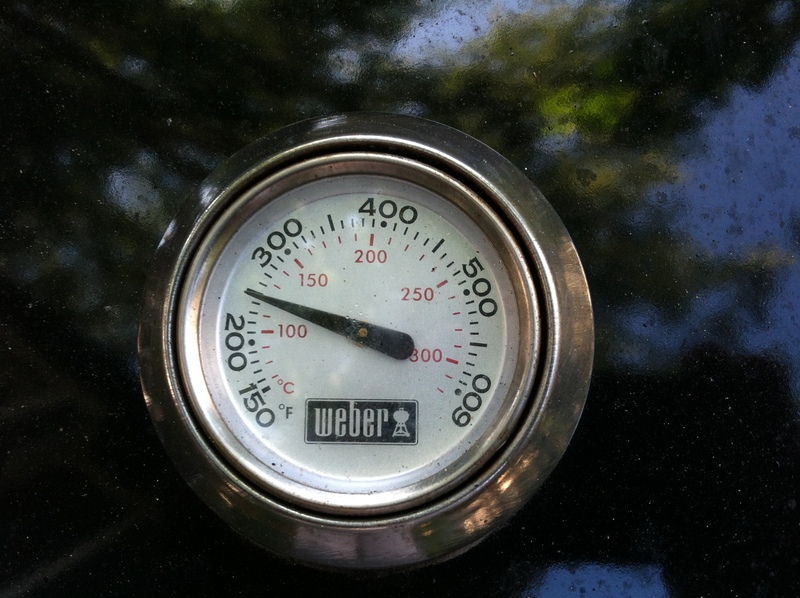 The only constant in my equation was the smoking equipment 22.5 inch Weber Kettle and a Smokenator 1000. Everything else? The end result of all my searches, feedback and research is shared below. Now, where to start? First of all, plan ahead, plan WAY ahead. This process takes several days to carry out correctly so its best if you try to aim for a particular weekend in advance. Once you have your date in mind, start getting your equipment together. As mentioned above, I personally smoke with a Weber Kettle and a Smokenator. For charcoal, I prefer Kingsford’s ‘Competition’ Charcoal which is now easily acquired at Costco. So at this point, you have the basics, smoker and fuel source; now lets get into the details. Now select the meat. 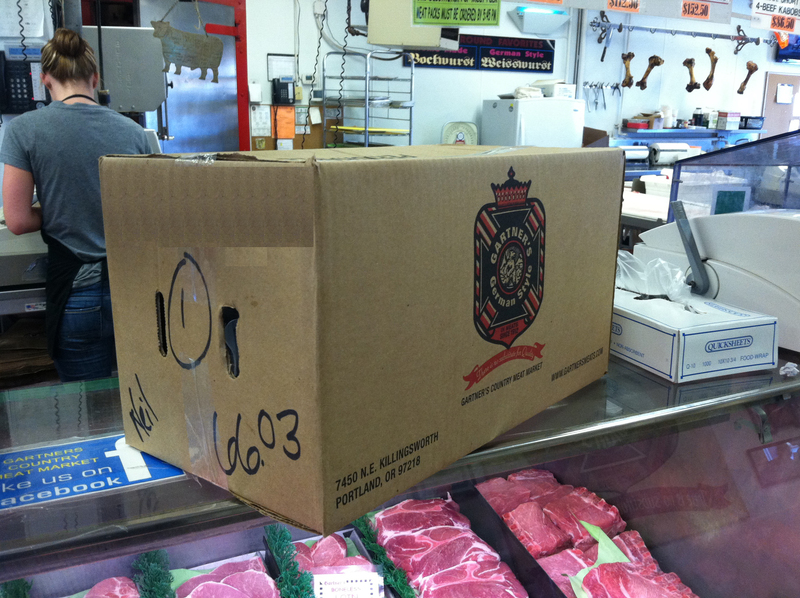 Get your meat from a butcher, not from your local major grocery store- the two reasons are 1.) quality (you’ll want to get the highest quality meat you can afford) and 2.) 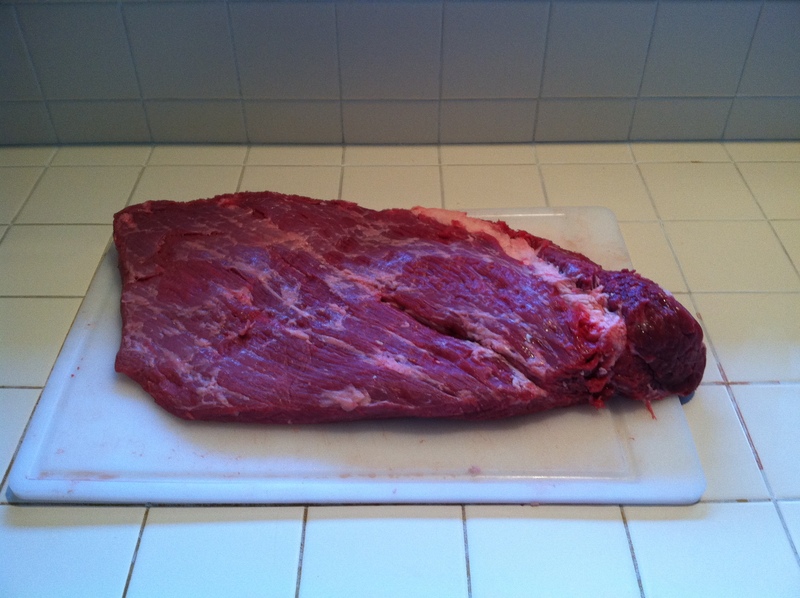 type (aim for a whole ‘packer’ brisket, which usually ranges from 12-17 pounds). In the Portland area, Gartners is a great place to go, that’s where I bought the meat for this cook. 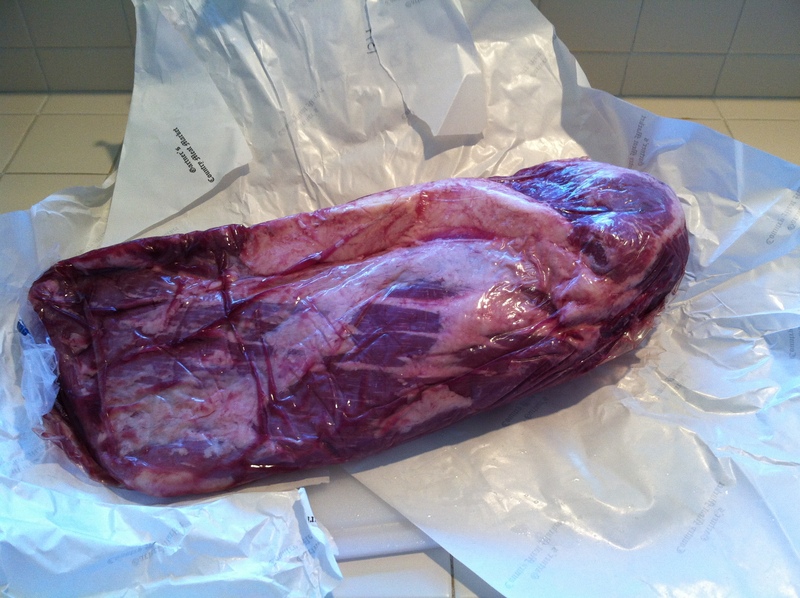 When you get your meat home, you’ll notice that whole packer brisket is wrapped in plastic- you’ll have to unwrap it and since this is a whole brisket, you’ll also have to trim it. With your meat trimmed, its time to prep it. If you watched the Aaron Franklin video, you’ll notice that he’s pretty ‘old school,’ salt a pepper only for a rub and post oak as the wood for the smoke. Since I’m not in central Texas, post oak is hard to come by up here in Portland (white oak is close and can be purchased in at many places in Portland, however) and also, Aaron has been doing things his very for a long time with great results- there’s nothing wrong with that; but I’m interested in what’s winning competitions right now and there are some common themes that deviate from Aaron. So overall, as you will see, I followed a somewhat different path than Aaron suggests. Most of ‘my’ ideas started from an amazing brisket page on AmazingRibs.com (this is a great thing to read all the way through before you cook your first brisket by the way- in addition to this page of course). 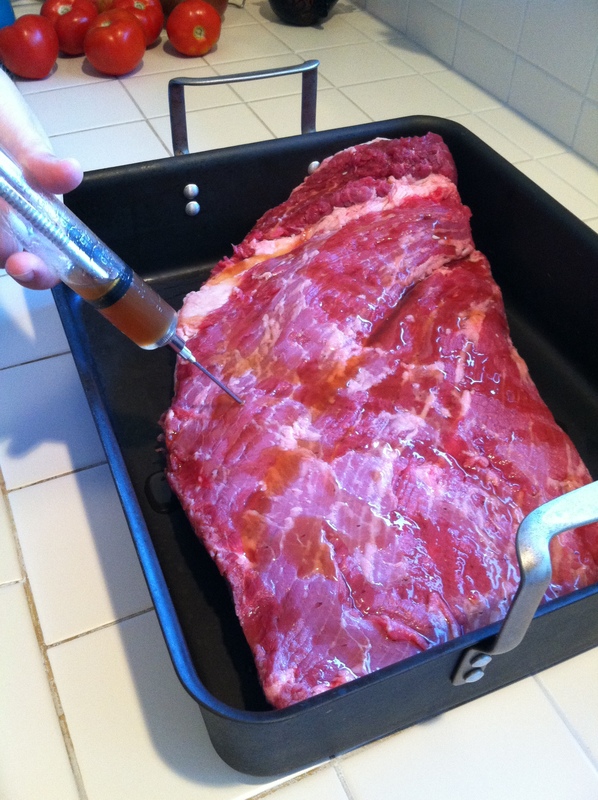 When injecting, get a good injector like this one and for the actual process of injecting, a great follow-up video from Butcher BBQ can be found below. I would suggest injecting your meat in a pan and go slow, it can get messy. Once you’ve finished injecting, wipe the meat off with a paper towel, as David suggests in the above video and get ready to put your rub on the meat. For the rub, I went with Butcher BBQ Premium Rub, mainly because their rub is designed specifically to have a flavor profile that goes great with their injection. 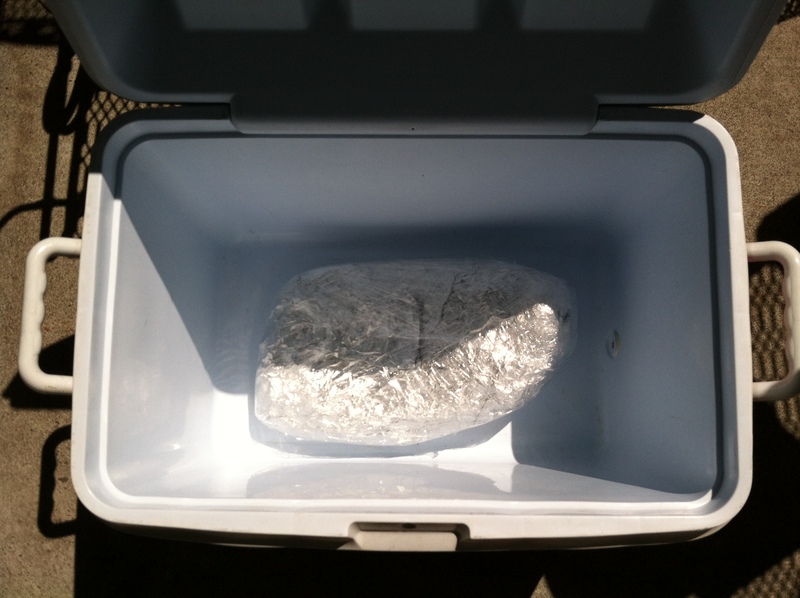 Then wrap it in plastic wrap to let sit in the fridge overnight. 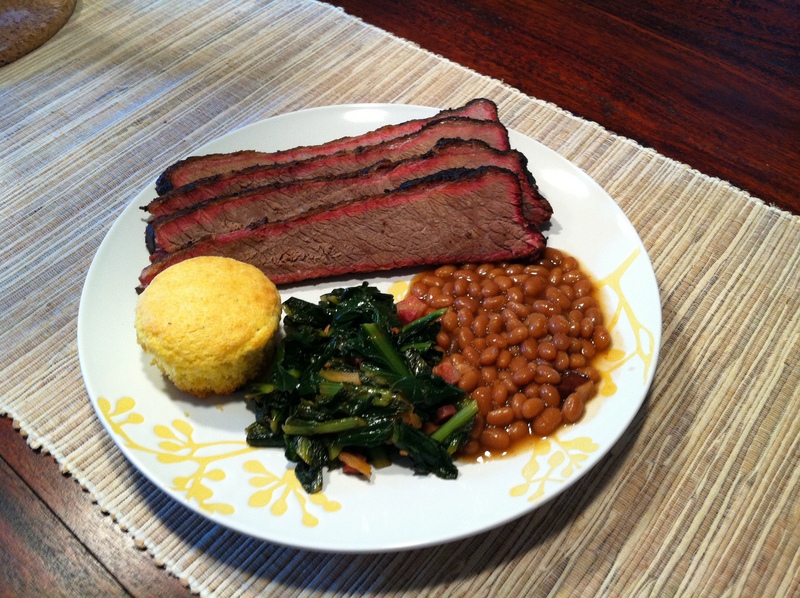 If you plan on serving this brisket for dinner, get up early! 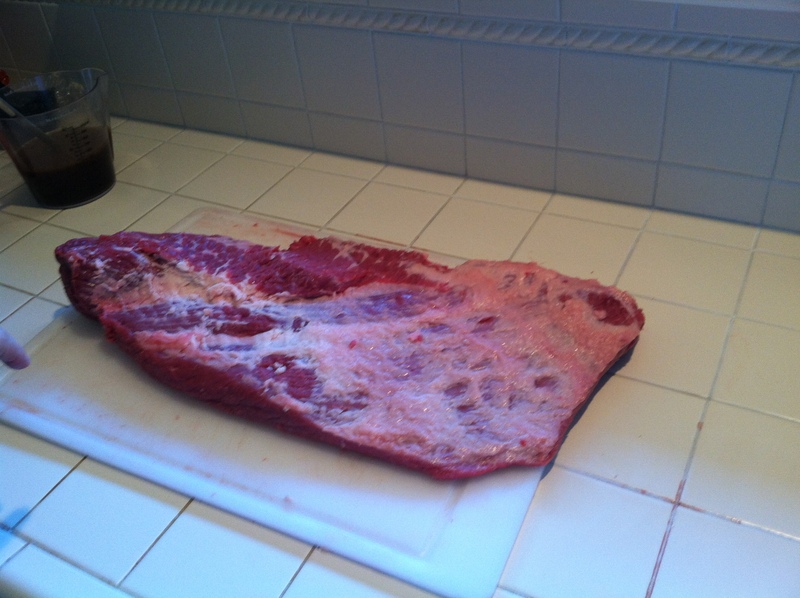 For this particular brisket, I got up at 4:30 to start the process. First, right when you get up pull your brisket out of the fridge so that it can start coming up to room temperature (a suggestion I did take from the Aaron Franklin video). 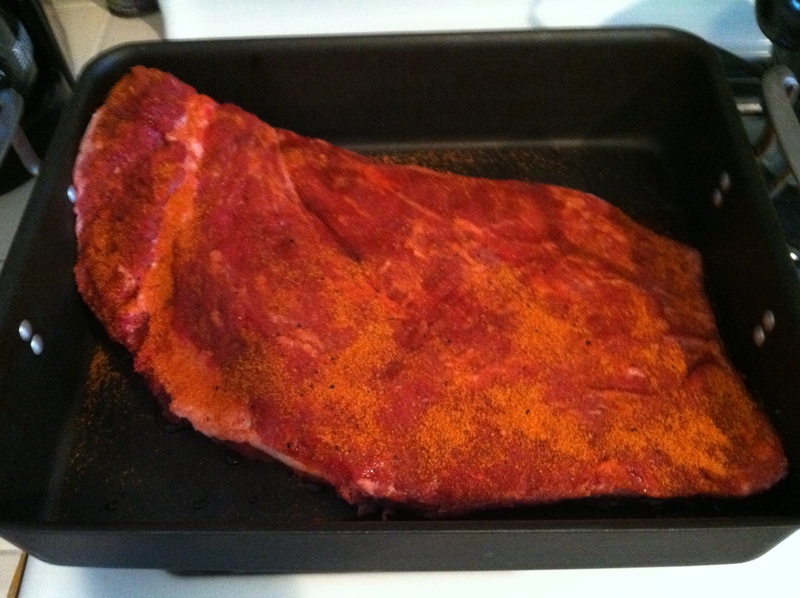 With the brisket out, prep your smoker. 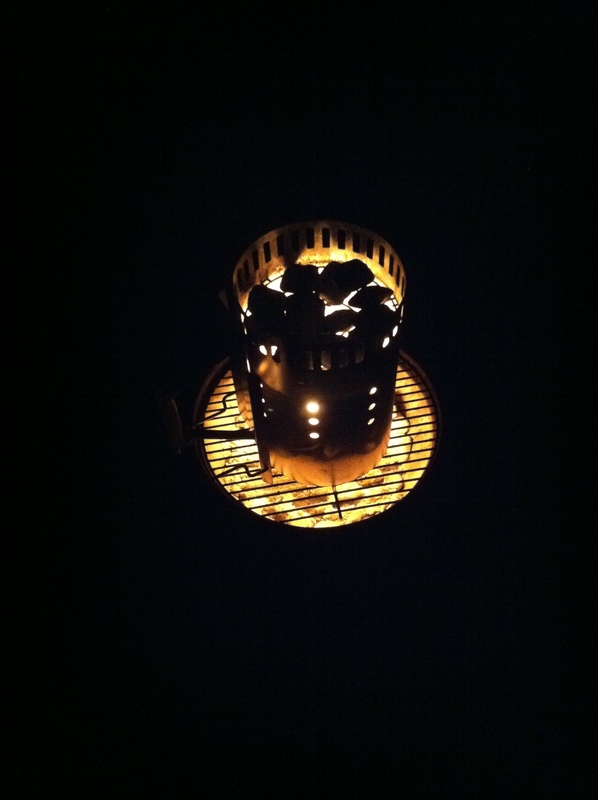 For the Smokenator, I set everything up the night before (see this post for info on how to setup your Smokenator) so that in the morning, all I needed to do was light the coals. Since the temp was low at about 4:45am when I started, I pulled 18 briquettes out of the Smokenator and started them going. While the charcoal was heating up (about 10 minutes), I got my wood ready. With something like beef, hard woods are best to smoke with- in Texas, Mesquite is used in the West, Oak in Central Texas and Hickory is used primarily in the East. For this cook, I went with a combination of Hickory chunks and Cherry Wood chunks (Cherry Wood is supposed to go exceptionally well with Butcher BBQ products, but can be a little light on a brisket). 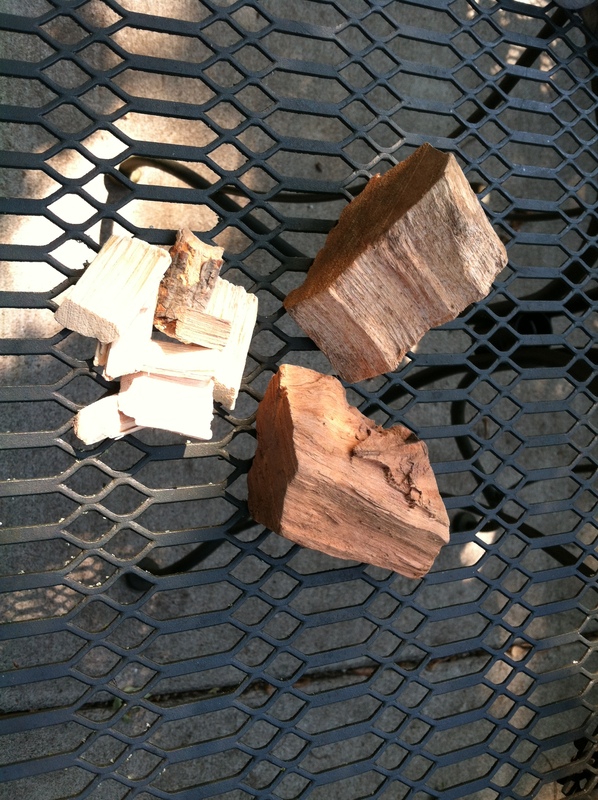 In the below picture you can see on the left, Hickory chunks, on the right Cherry Wood chunks and at the bottom hickory chips (for comparison purposes). Once the coals were ready, I loaded them in the Smokenator and placed 3 chunks of wood on top of them- 2 hickory chunks and 1 cherry chunk. I also used my normal approach of a larger water pan to keep the temperature down and make the kettle environment a little more moist. About 15 minutes later, the kettle was stabilized at about 250 degrees at the top of the lid and smoking well; now time to put the brisket on. At this point, I went back to bed and set an alarm for an hour later. After an hour I came out and the temperature was fine, but there wasn’t much smoke. 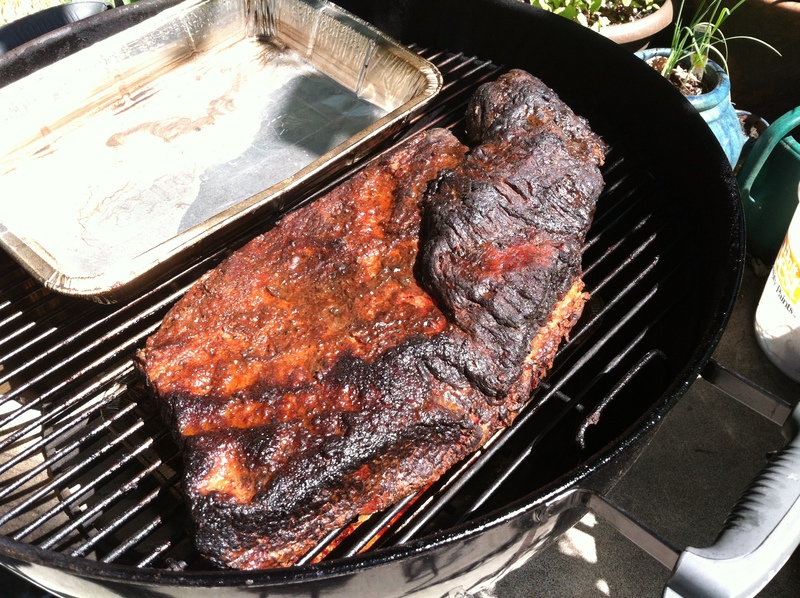 I lifted the lid and added another chunk of wood- cherry; the increased oxygen from the lid being off ignited the other chunks I had placed in previously and rather quickly, the smoke started cranking- so I put the lid back on and went to sleep for another hour (they should call this ‘BBQ Sleep’). After another hour I put 2 more wood chunks on the coals- both hickory (basically I’m looking to maintain a 50/50 split between hickory and cherry while smoking). I also placed the probe in the meat after the second hour (you can put the probe in at any time, by the way, there was no reason why I waited for the second hour to do this). Once the probe is in, you’re looking for an internal temperature of 160 degrees. The time it takes for your meat to reach 160 can vary widely, sometimes just a couple hours, sometimes many hours. This brisket took about 5 hours to get there- so I continued to add about 2 wood chunks every hour- with the softer cherry wood there is not much risk of over smoking using the approach I’ve outlined (FYI). 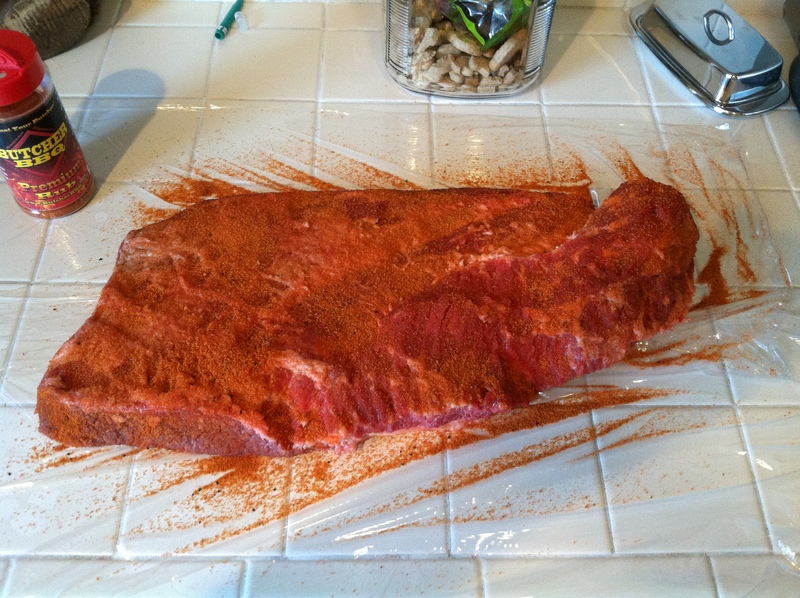 Once the brisket reaches 160 internal, its time to wrap it (known as the Texas Crutch). 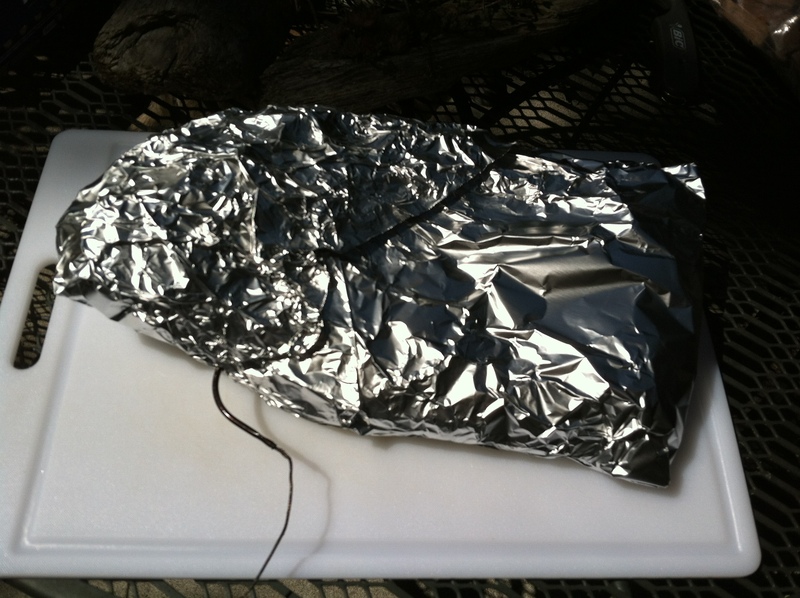 Wrap the brisket in about 4 layers of aluminum foil, then place your probe through the layers to about the same spot where the internal temperature was measured for the smoking phase of the cook (about where you placed the probe initially- just estimate when the foil is on since you’ll be poking through it). 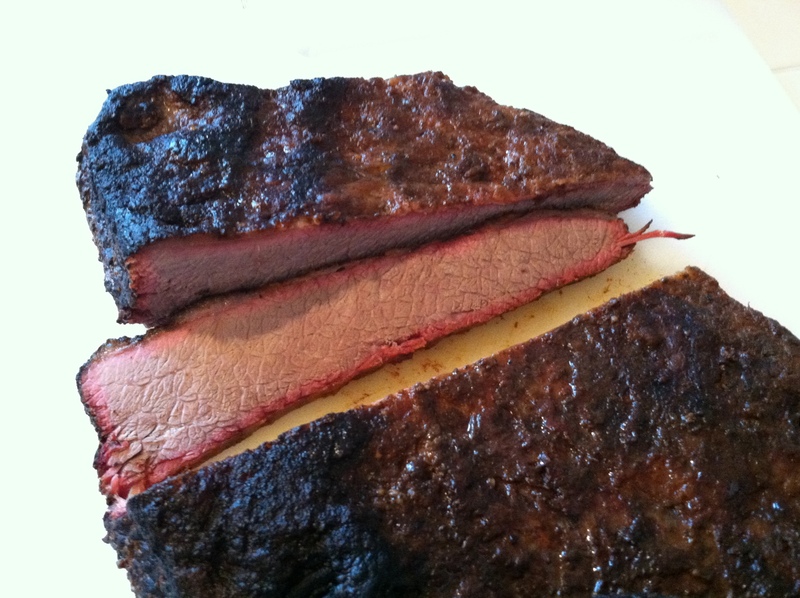 Place the brisket back on the smoker (no more smoke is needed) or in your oven and wait for the internal temperature to hit 203- this can take anywhere from a couple hours to many hours, its all about the cut of meat you’re working with. 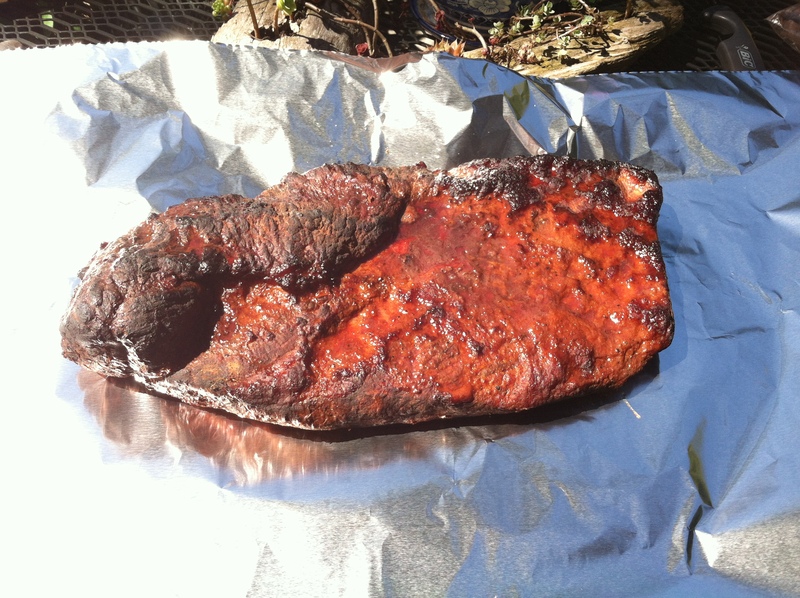 When the brisket reaches 203, I like to unwrap it and throw it back out on the smoker (water pan removed) for about 30 minutes, to allow the bark to firm back up again. 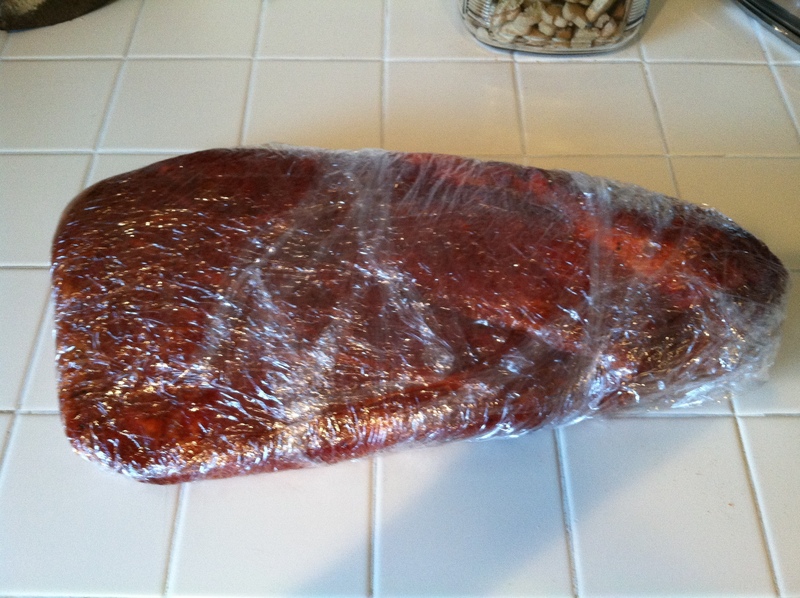 After the bark has dried out a bit, its time to re-wrap the brisket and let it sit before eating. 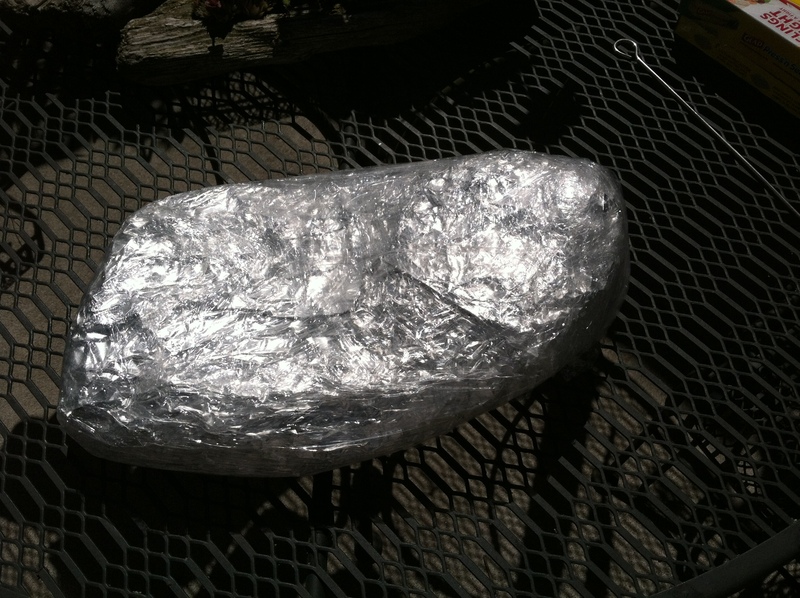 The process is about the same as when the brisket was wrapped before; 4 layers of foil but then a final layer of plastic wrap (to prevent it from leaking). 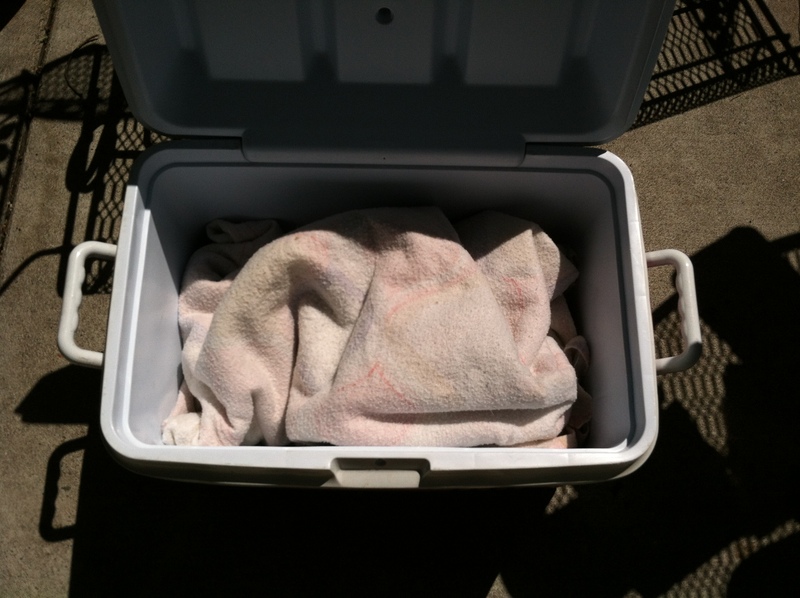 And cover with a towel or blanket. Let the brisket sit for at least 30 minutes before eating, but personally, I like to let it sit for 2-3 hours to really let everything become nice and tender. To complete the meal, we added some greens, corn bread and baked beans. 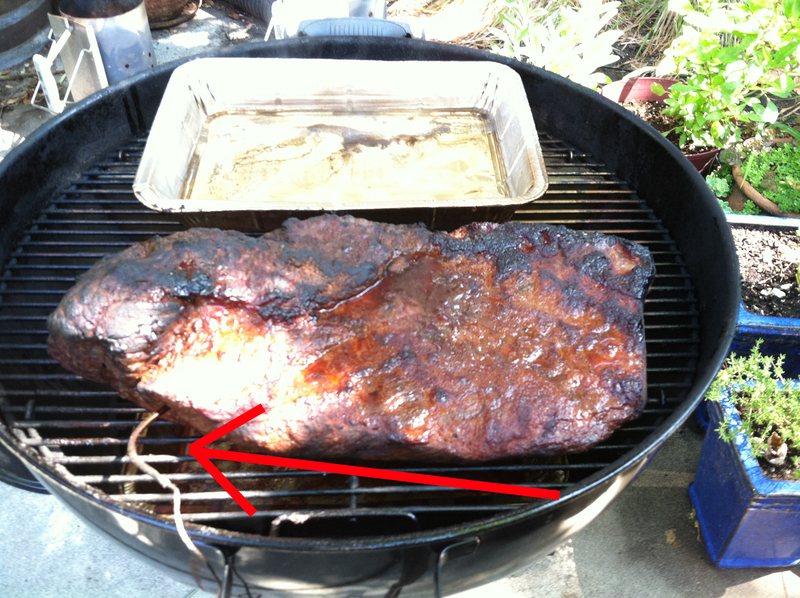 This entry was posted in BBQ, Recipes and tagged BBQ, Brisket, Butcher BBQ, Kingsford, Smokenator, Weber. Bookmark the permalink.